3 Exploration Licences in north-eastern NSW (EL4474, EL5339, EL7679) cover all known areas of mineralisation; 132 square kilometres. The area is well known for Direct Ship (DSO) extremely high grade, small tonnage (less than 30,000 tonnes) massive sulphides. DSO grades typically range from 19-35% Zn, 6-20% Pb, 1-4% Cu, 1-90oz Ag. EL 4474 and EL 5339: Force Commodities holds 100%. EL 7679: Force Commodities holds 55% in JV company. Massive sulphide deposits characteristically occur in clusters of several deposits and areas subjected to mature exploration can contain a giant deposit. Halls Peak is a prime exploration area as it has not, until now, been subjected to modern airborne geophysical exploration. “Halls Peak, …. is a classic sedex massive sulphide system with potential to discover a large, Mt Isa sized deposit.” Greg McKelvey, Retired Vice President Phelps Dodge sedex systems South America 2006. Mr. McKelvey has given consent to publish his findings. Known deposits. All deposits discovered originally from outcrop. Several other similar-scale deposits discovered to date but not included in table below. Note not JORC compliant. The average grades have been calculated from limited assay data, insufficient to provide an accurate measure. The measurements have been undertaken to provide both “ballpark” estimates of possible resources and readily testable exploration concepts for shallow DSO. Based on drill hole data, open file exploration reports and mapping by the Geological Survey of NSW. High Grade Shallow Intersections 2013 Drilling Gibsons Mine - Drilling confirms multiple closed-spaced ‘stacked’ lenses/lodes. Large tonnage (100,000 – 100mt) massive sulphides. Steeply dipping, deep tapping structurally controlled Cobar-style. VTEM anomalies (1,221 line kilometres heliborne survey flown) with potential sulphide responses including large flat lying conductors in relatively undisturbed sedimentary basins, Target – Large zinc/lead deposits – eg. HYC (MacArthur River). Greg McKelvey, Retired Vice President Phelps Dodge sedex systems South America 2006, after studying geochemical vectors, predicted that the potential site for the formation of a large sedex deposit would be located immediately east of the growth fault hosting the copper-rich Sunnyside and Mickey Mouse Deposits Prediction now strengthened by the discovery of a large flat lying VTEM conductor at depth at this location. NOTE: The broad conductive zones could be the response of an economic Zn-Pb-Cu-Ag sulphide body but equally could be response of pyritic carbonaceous (graphitic) black shales with sub-economic sulphides. Normally highly Conservative Geophysicists have stated “These conductors appears to terminate against the same northeast-southwest structures which are spatially associated with several historical workings. These should be the highest priority for ongoing exploration. Evidence of source migration from early to late time towards these faults may be indicating thickening sulphide closer to the fault. This does not appear to be consistent with typical VMS systems, but may be more aligned to sedimentary exhalative (SEDEX) processes.” Southern Geoscience Consultants Pty. Ltd. 2012. The McArthur River SEDEX system is world class deposit. Pre-JORC geologic resource of 227M tonnes at 9.2% zinc, 3.1% lead, 0.2% copper and 41 g/t silver. Halls Peak’s anomaly is flat lying and controlled by faults, similar to McArthur’s SEDEX structural setting. 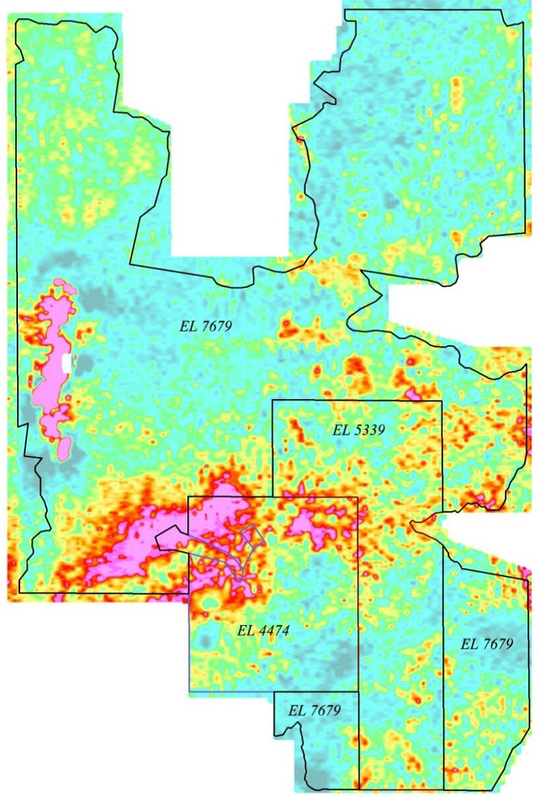 Comparison of Halls Peak potential SEDEX Deposit (left figure in pink) with McArthur River Deposit (right). Deep Conductor and Structure Fits Classic SEDEX MODEL, SIGNIFICANT POTENTIAL Simplest Fit. A request for an opinion on a possible anomaly similar to the Caber base metal deposit in Canada, in the Spike Island area in the north east of EL7679, resulted in an offer of interpretation by Geotech Airborne. The interpretation concluded “In general the conductive zone is complex and consists of two types of conductors: 1) steeply dipping (or subvertical) conductors and 2) subhorizontal blocky, lens or layer similar conductors. geologically the steeply dipping conductors likely reflect faults which could be channels for sulfure solutions transportation (feeding channels); and adjacent subhorizontal conductors can be interpreted as sulphide-beds.